For Northern Hemisphere observers, August is usually regarded as "meteor month" with one of the best displays of the year reaching its peak near midmonth. That display is, of course, the annual Perseid Meteor Shower beloved by everyone from meteor enthusiasts to summer campers. But sky watchers beware: You will be facing a major obstacle in your attempt to observe this year’s Perseid performance, namely, the moon. This year, the moon will be full on Aug. 13just in time to seriously hamper, if not all but prevent, observation of the peak of the annual Perseid meteor shower, which is predicted peak overnight on Aug. 12 and 13. Bright moonlight will flood the sky all through that entire night and will certainly play havoc with any serious attempts to observe these meteors. But there are still some chances, including three dark nights this week, for skywatchers to search for Perseids, weather permitting. The Perseids are typically fast, bright and occasionally leave persistent trains. 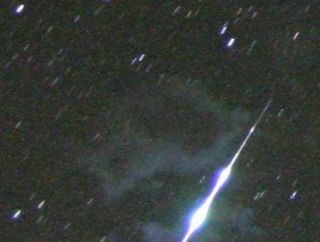 And every once in a while a Perseid fireball will blaze up bright enough to be quite spectacular. The meteors are more than capable to attract attention even in bright moonlight. With this as a background, perhaps the best times to look this year will be during the predawn hours several mornings before the night of full moon. That's when the constellation Perseus (from where the meteors get their name) will stand high in the northeast sky. In fact, three "windows" of dark skies will be available between moonset and the first light of dawn on the mornings of Aug. 9, 10 and 11. Generally speaking, there will be about 2 1/2 hours of completely dark skies available on the morning of the Tuesday (Aug. 9). This shrinks to about 1 1/2 hours on Wednesday, and to less than a half hour by Thursday morning. The 2011 Perseid meteor shower viewing table here shows prime skywatching times for some selected cities. All times are a.m. and are local daylight times. "Dawn" is the time when morning (astronomical) twilight begins. "Window" is the number of minutes between the time of moonset and the start of twilight. This table offers prime viewing times for the 2011 Perseid Meteor Shower for selected cities for the days of Aug. 9, 10 and 11, in 2011. All times are for local time zones only. Dawn is the start of twilight conditions. Window is the number of minutes between moonset and twilight conditions. Here's an example: When will the sky be dark and moonless for Perseid viewing on the morning of Wednesday, Aug. 10 from Houston? Answer: there will be an 89-minute period of dark skies beginning at moonset (3:49 a.m.) and continuing until dawn breaks (5:18 a.m.). Perhaps up to a dozen or so forerunners of the main Perseid display might appear to steak by within an hour's watch on these mornings. In the absence of moonlight a single observer might see up to 100 meteors per hour on the peak night, a number that sadly cannot be hoped to be approached in 2011. In fact, it appears that this year, Perseid fans will be uttering the same lament that the old Dodger fans in Brooklyn used to: "Wait till next year!" Editor's note: If you snap an amazing photo of a Perseid meteor this year and would like to share it with SPACE.com for a possible story or gallery, please contact managing editor Tariq Malik at: tmalik@space.com.